I'll confess that I'm a bit of a list person. I like writing lists then crossing things off. Not just for shopping, but also for managing daily life and work. At work in particular I use a spreadsheet to manage tasks, which I update at the beginning of each week. It's always nice to get to the end of a week and look over what I've got done. 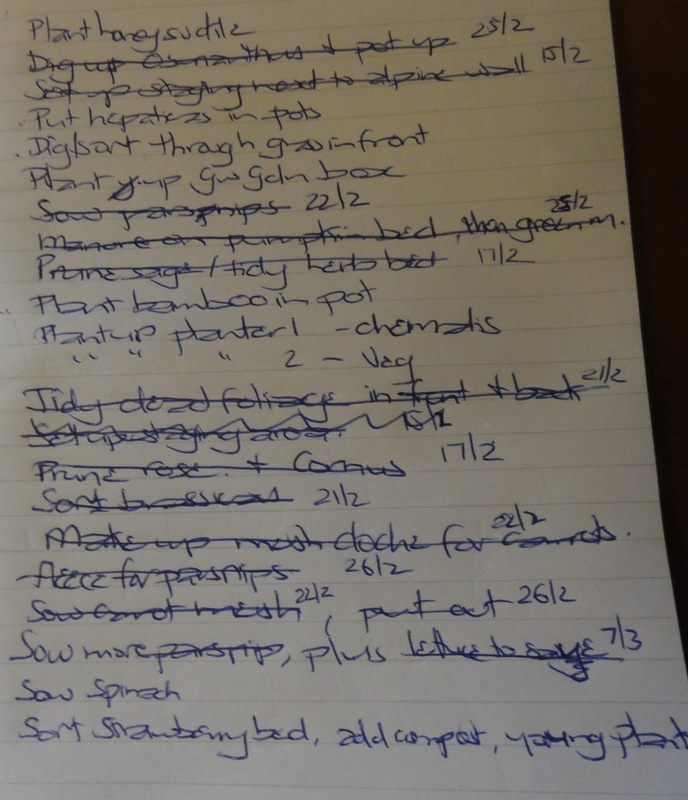 However, when it comes to gardening, pre-ME I didn't use lists that much. I generally knew what I wanted to do and let the months and seasons guide me. But recently I've started making lists for gardening too. I came to the decision that I needed to start compiling gardening task lists, for two reasons. Firstly, I was finding that I couldn't as easily keep everything in my head as I did when healthy. Keeping lists in your head uses up quite a lot of cognitive resource energy. By writing a list I free up that energy for something else, such as cooking. Secondly, I found I often felt upset at my perception of 'how little' I did in the garden. I would say "I only got x done" or "but I have so much else to do", with the implication I wasn't doing enough. This was of course being unfair to myself, expecting that I should be able to do and achieve (a bad word, I know, but apt in this context) the same as I did when I was a healthy gardener. Being constantly tired not only means I have less energy to do, but less energy to think about doing. Writing lists, crossing off a task, gives me a strong personal sense of achievement. In this case I'm using 'achievement' to mean respecting myself and the context within which my health is situated. In fact I've found crossing tasks off a list, no matter how small, adds to my joy of gardening again. Because now I think "wow, I'm getting a lot done given how little energy I have". Quite often I add a task to the list after I've done it, and then cross it off immediately! I guess that may seem a little crazy, but it's actually about acknowledging all the work I do in the garden. Take 'sowing Brassicas'. On the surface what might seem simple and obvious isn't. I first have to dress appropriately, adding an extra layer as ME seems to have made me feel the cold much more than I used to. Then it's digging the seeds out of the seed box, unlocking the garage (my shed), getting out the pots and compost. Sowing, watering, putting the newly sown pots into the greenhouse. Tidying up, coming back inside, changing out of gardening clothes and having a rest. So if I hadn't included this task on my list before, I add it later to remind myself of the energy used, and respective value of, even a simple kitchen garden task. 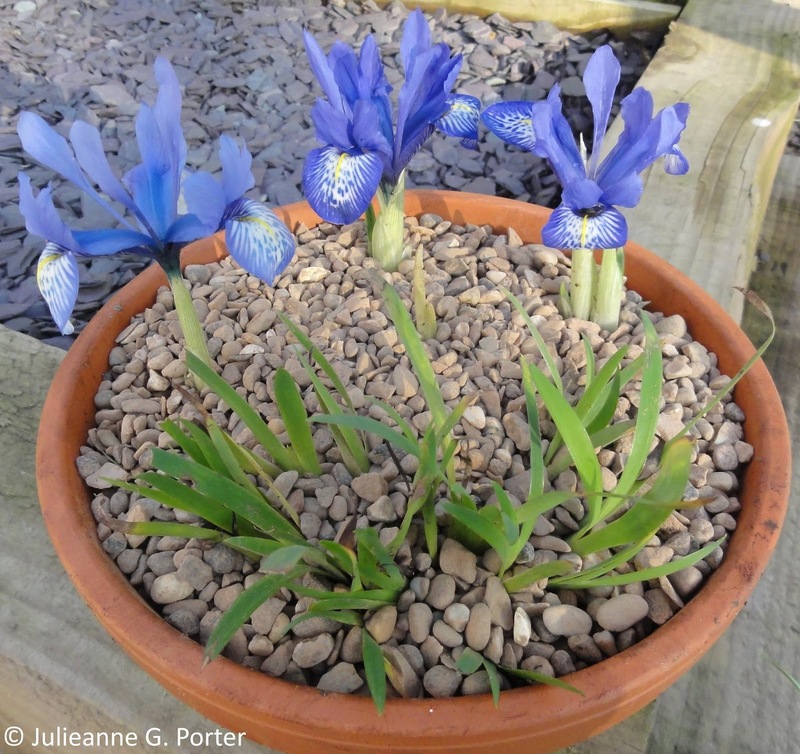 Of course, sometimes it is nice to go out into the garden, throw the list to the wind and just potter. Yes, there are things I want to get done and ticked off, but one of the great joys of gardening for me is pottering. Whilst having ME has meant I have needed to be more focused with how and where I'm using my energy in the garden, it's also good for the ME soul to occasionally go into the garden and have a good potter about. It's nice to get things done (tick), but it's good on occasion to have enjoy some pottering freedom. I hope to (will) return to health and do away with the gardening lists eventually. But until then, lists help me maintain a positive sense of what I get done in the garden, even within the limitations of a chronic illness. Now, I'll just go and tick off writing this blogpost from my other task list. Tick. I welcome your comments and thoughts. And if you blog about gardening with ME/a chronic illness, link to this post in your blog, and leave a comment below with a link to your post, so we can all find each other. Oh, I missed your last post. Could you link to it here in the comments, so others see it too? Dear Julieanne, thanks for visiting my blog and leaving a comment! It took me quite a while to check out if you are writing a blog as well and I was delighted that you do and also that you are gardening in England. I absolutely love England! But back to your post: I am actually 'a to do list person" as well. I am writing lists for exactly the same reasons that you state in your blog post and find it quite satisfying to cross something out, when a task is completed. I also like the encouraging feedback that I get from a list, when I see how many things I have accomplished. I have a house full of lists, Julieanne - about gardening and everything else - otherwise I would never remember anything! But like you I find they are also helpful to remind me how much I have accomplished. I have finally managed a post about gardening with ME - it's here.